�����The metals have been the primary interest for buyers at shows and shops over the last few months. With the Whitman Coin and Currency Convention beginning this week in Baltimore, dealers are hoping for a little run in the price of metals to encourage retail sales. The metals market has been a bit lethargic this past week, however, buyers are still participating even when prices fall, taking advantage of lower overall costs. �����Premiums for modern and classic generic Gold coins have dropped over the last few weeks. Many of today's premiums for common date $10 and $20 Gold coins are at or near all-time lows. Some of these coins can be purchased near the price of high grade Modern Eagles. 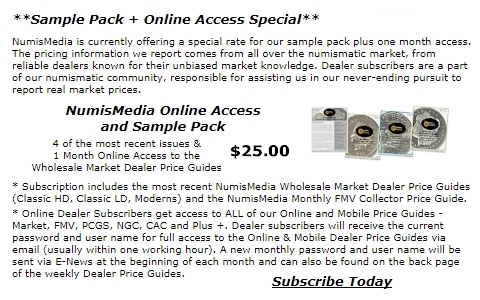 As a result of these lower premiums, there are a multitude of declines in this week's HD Wholesale Market Dealer Price Guide in the U.S. Gold charts. �����Morgan and Peace Dollars have fallen from their recent highs. The Market price for Morgan Dollars in MS65 is now at $175, while MS64's are down to $80. Peace Dollars declined to $170 in MS65 and $74 in MS64. There is still a lot of interest in Dollars at the current levels. GSA Carson City Dollars are extremely active at present Market prices with several buyers reporting a heavy increase in buyer participation. Sales for the highest graded coins are very competitive as we have seen in several recent major auctions. Numerous increases can be found in the P/L and DMPL Morgan Dollar charts this week. The 1879 O DMPL moved to a higher $22,500 in MS65 and the 1896 rose to $6,100 in MS66. There is a lot of demand for a limited quantity of coins on the market.